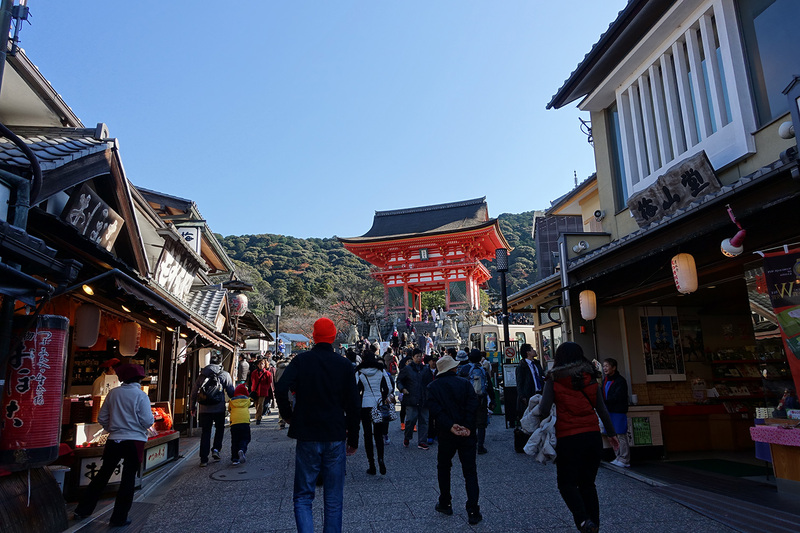 We trekked through the streets and eventually we came upon the temple complex itself. 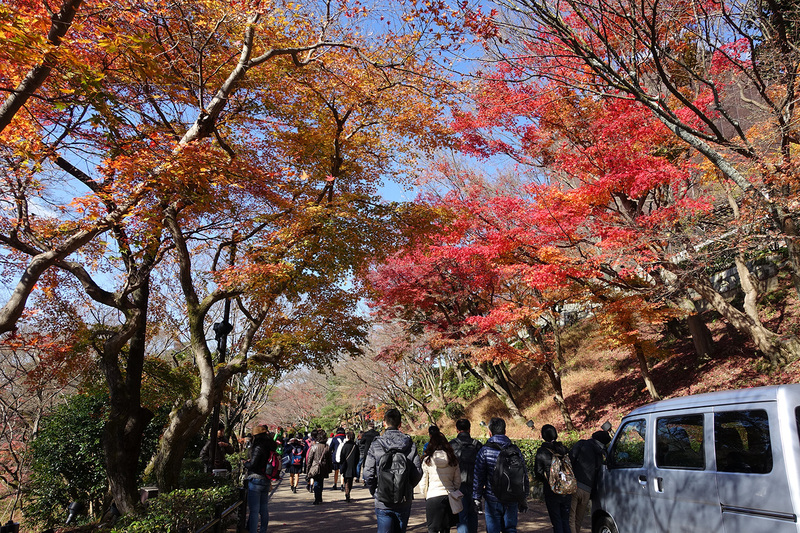 There were quite a few student tour groups that arrived shortly before we did so the streets were packed with students. 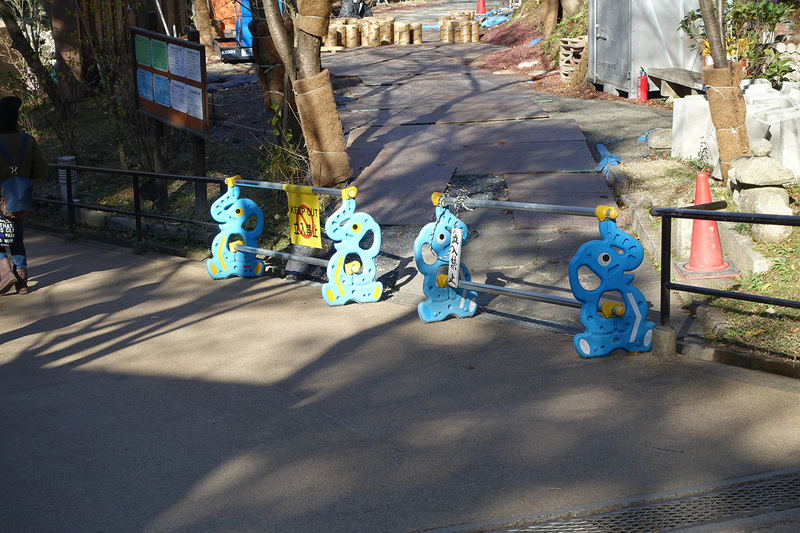 They were all quite polite, though, and it was fun seeing them all so excited to be on their school trip. There were plenty of other tourists as well: groups from China and individuals from Japan, Korea, Europe, the U.S., and Australia (those were just the ones we could make out). 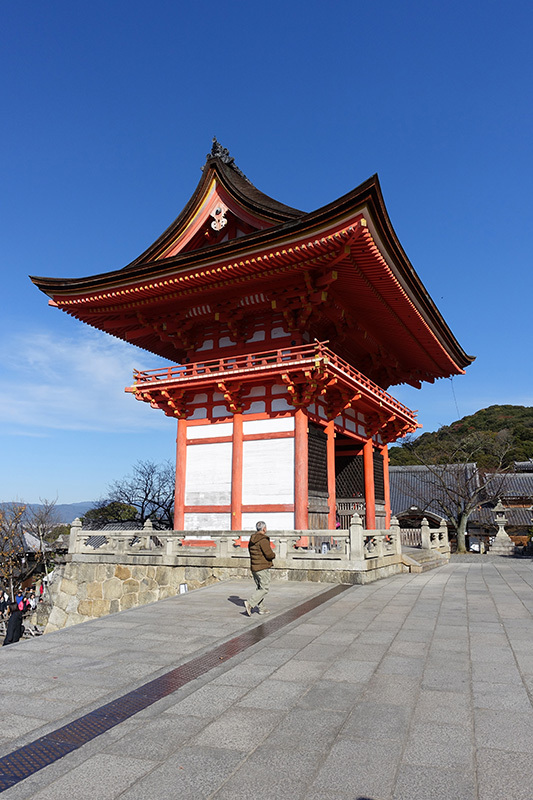 Most people made a deliberate line for the orange gate pictured in the last 2 photos above but a few intrepid souls looked to the sides and found some quieter areas where they could take photos in front of some lovely if not particularly popular buildings. 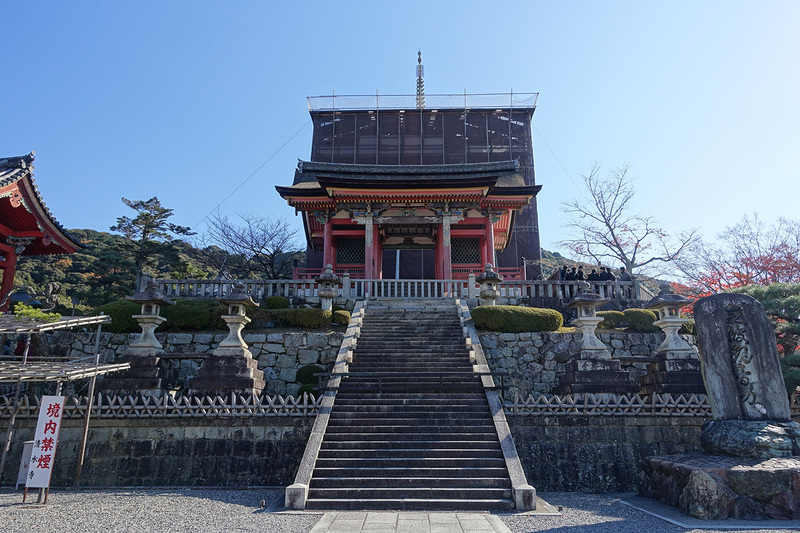 Some parts of the temple were under construction/restoration, which makes sense as this is not a peak tourist season, but that meant we couldn’t see everything in its glory, like this 3-story pagoda at the entrance. That was ok, though – there was still plenty to see! 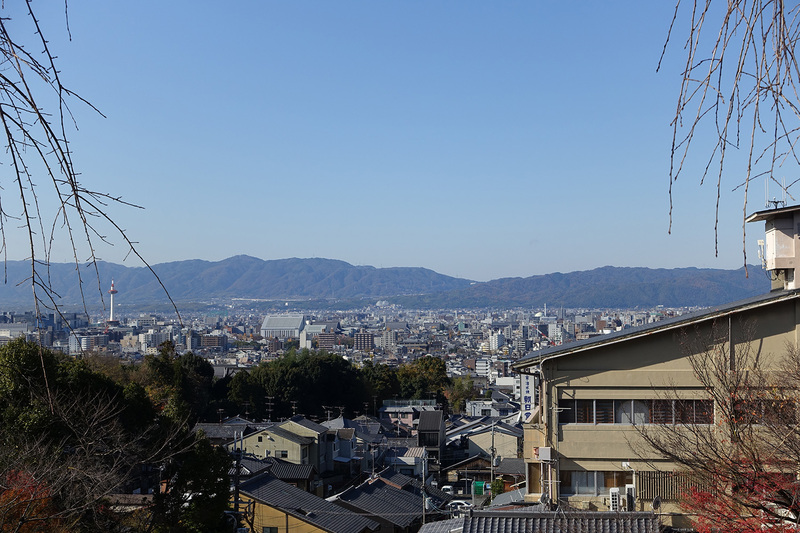 Speaking of which, turning around from the picture above gave a gorgeous view of the city of Kyoto. We were really lucky to have scheduled out trip for such a clear day! 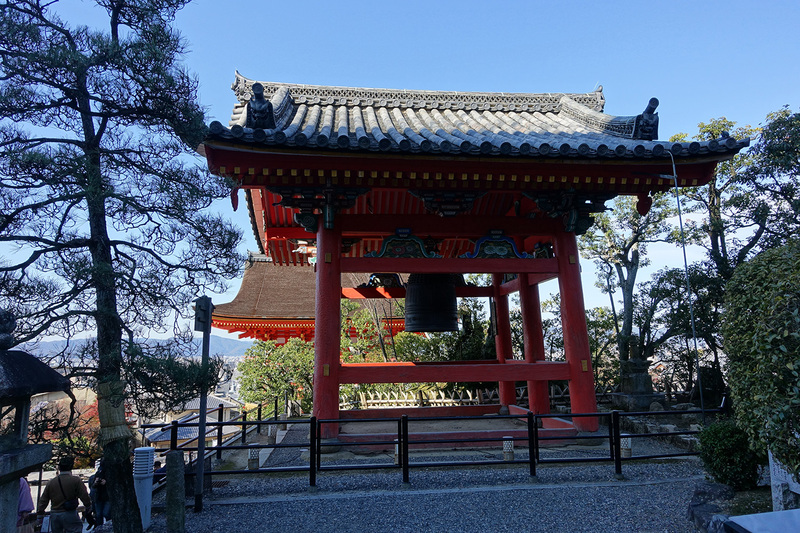 We followed the designated path to purchase our tickets and passed by the temple bell on our way. 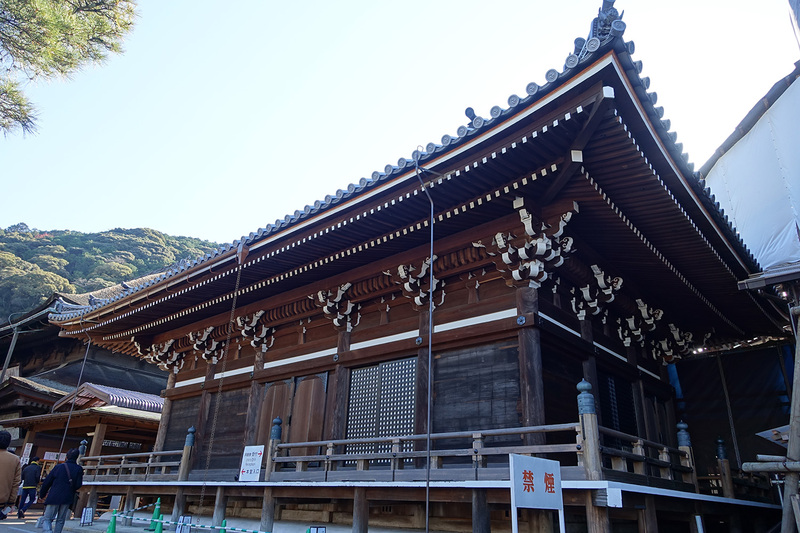 We were able to get a good view of some of the temple architecture as we made our way to the ticket office. 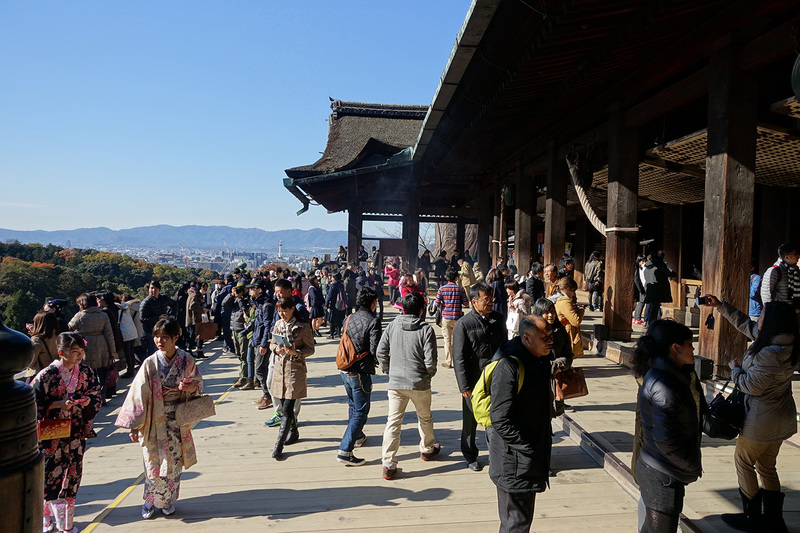 Once our tickets were purchased, we were able to go into the temple area with its famous deck and view of the surrounding hills and city of Kyoto. 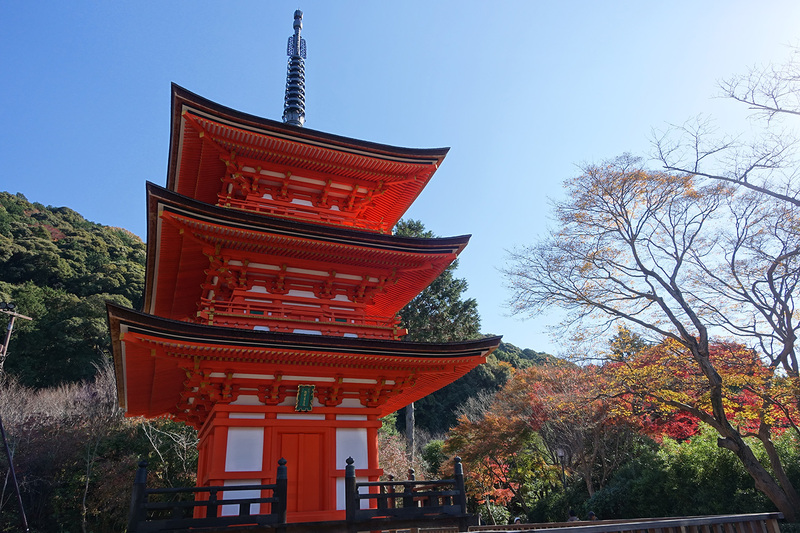 From here we were able to see the Koyasu Pagoda, the orange structure in the photo below. 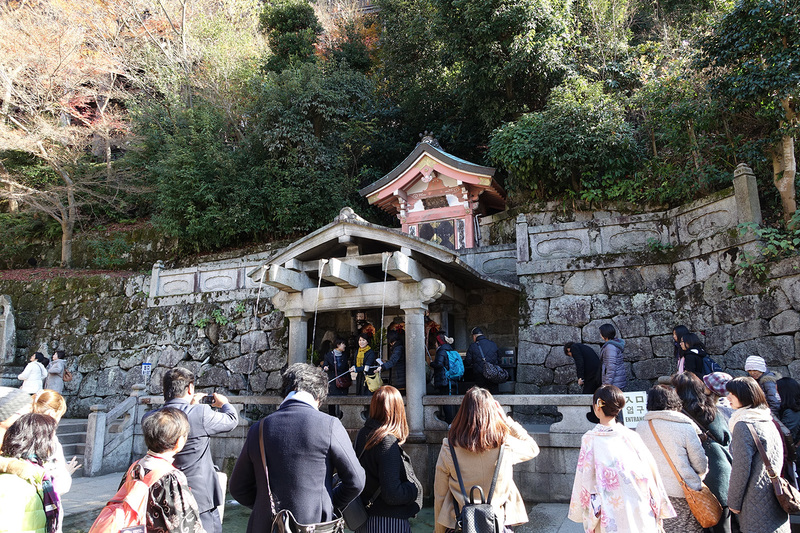 We were also able to view the Otawa Waterfall from this vantage point, where people lined up to drink the waters that supposedly have wish-granting powers. I’ll have a photo of this from ground level later than this post. 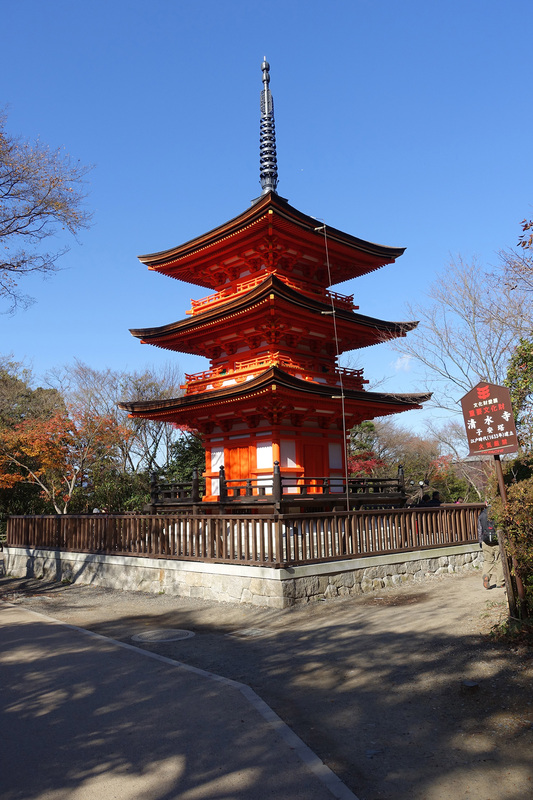 We continued our path to view the Koyasu Pagoda up close and on the way got a great view of the temple we just visited. We came at the tail end of the peak fall colors so many of the leaves had already fallen on the mountain but as you’ll see we did find patches of color further down the mountain. 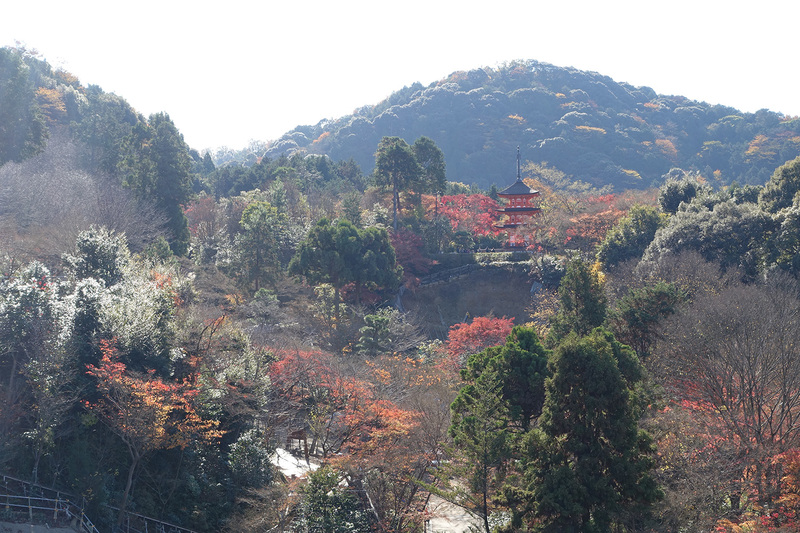 It wasn’t a long walk to the pagoda but even if it was it would have been worth the effort. 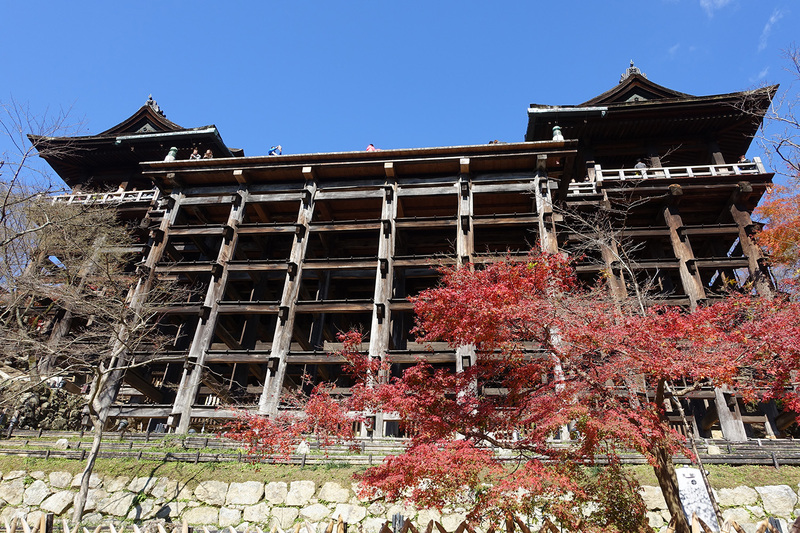 It was really a beautiful structure and, surprisingly, it seems most visitors do not come up this way, preferring to head straight for the waterfall that will grant their wishes. It was a particularly pretty sight with the fall colors nearby. 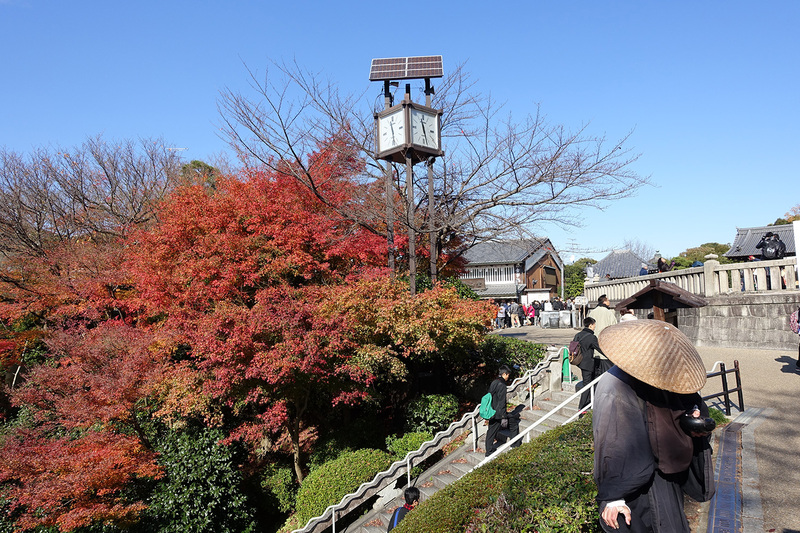 We made our way from the Pagoda down the hill to the waterfall and on the way passed various small paths like this one with the fall colors in full force. The line for the waterfall was long so we didn’t stop to drink but it was neat to see how excited people were to try the water. 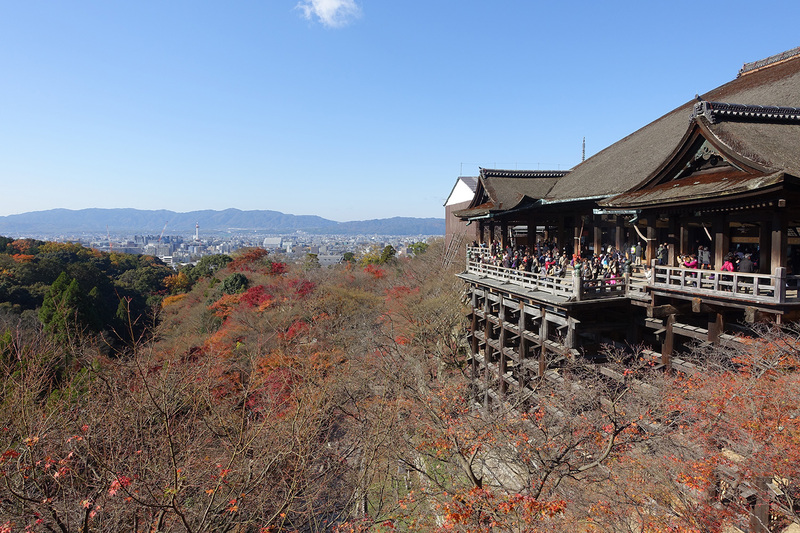 There were quite a few young ladies like those above wearing traditional kimonos. 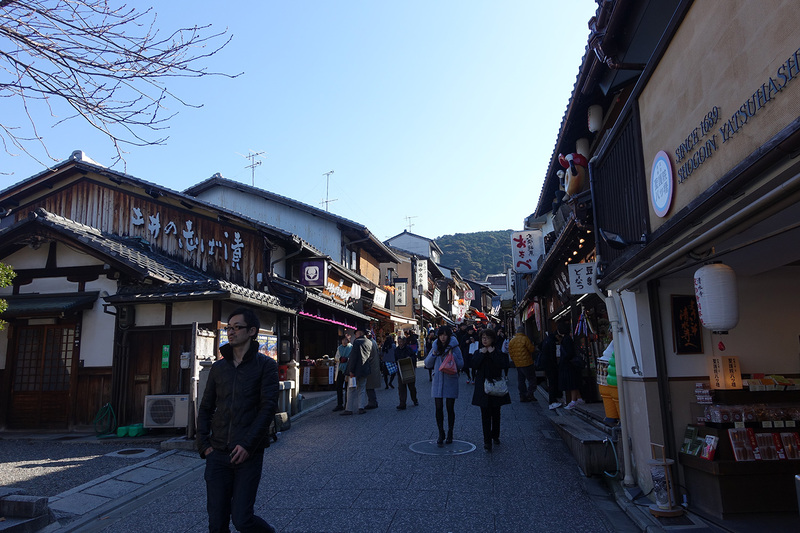 There are kimono (yukata in the summer) rental companies in Kyoto where one can be dressed in traditional attire and walk around Kyoto. I don’t know how these ladies managed since it was so cold out but all of them looked lovely. 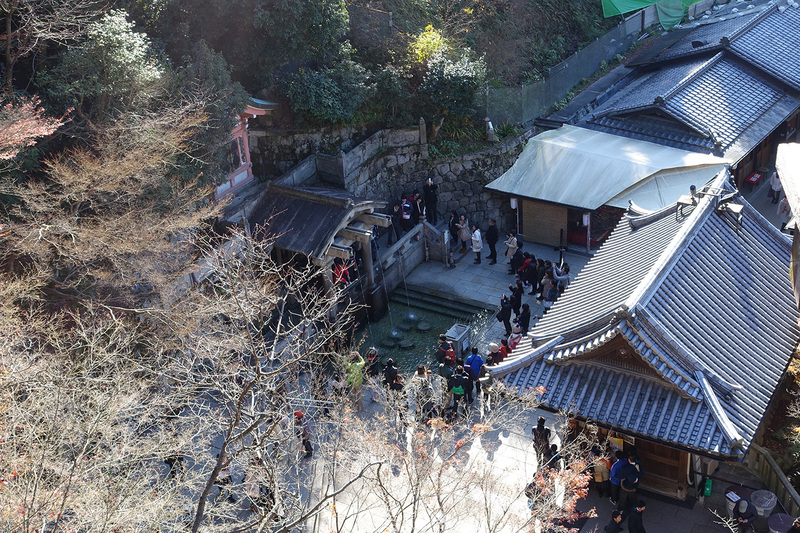 Here is a view of the temple looking up from the waterfall. It really is an impressive structure! 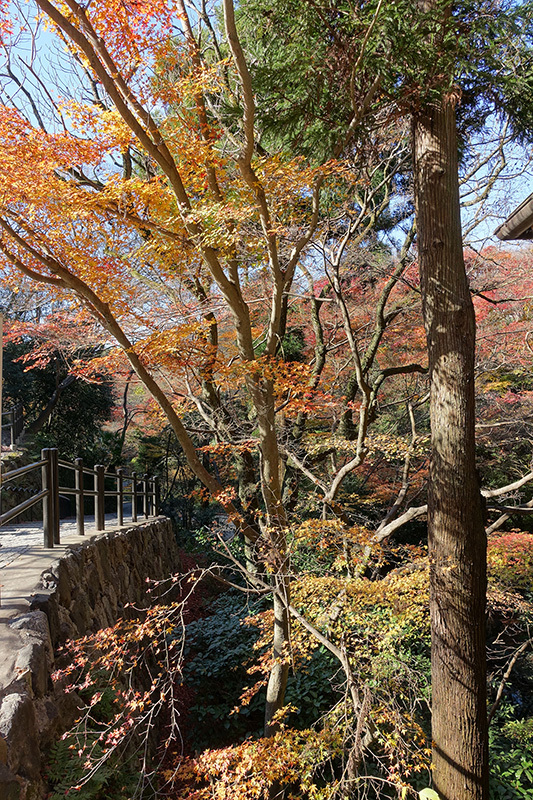 As we made our way out of the temple grounds, we passed by even more trees with gorgeous orange and red leaves. There is a pond near the entrance/exit that I had to include her as well. Though a lot of the trees around it are missing their leaves, a few remain and have bright pops of color. 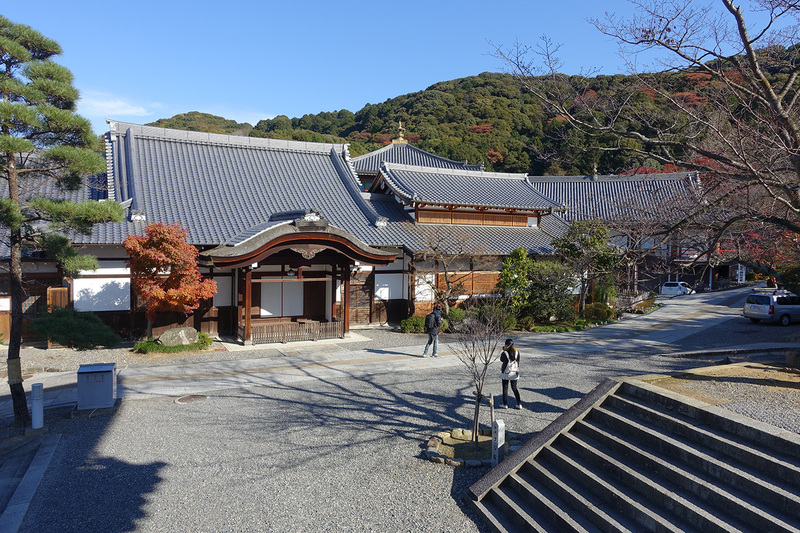 I’ll leave you with one last picture taken as we departed the temple grounds where we found a patch of brightly-colored trees. 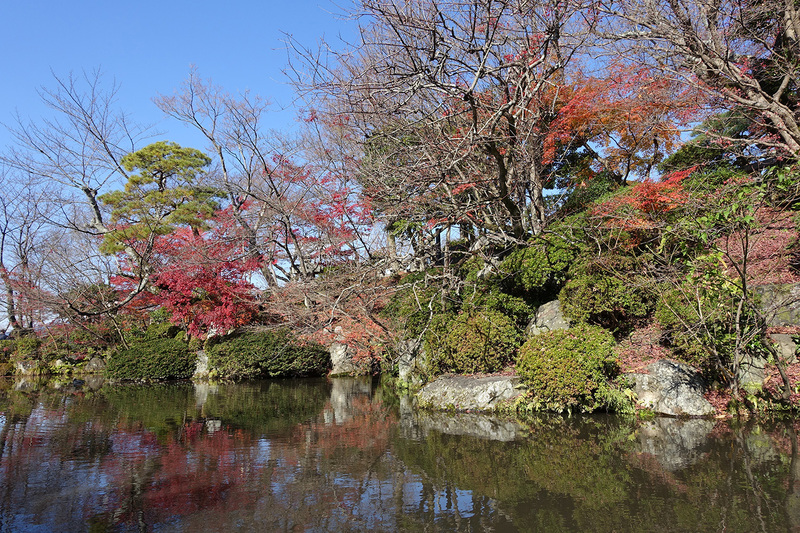 Part 2 of the Day 8 posts will include our next stop, Ginkaku-ji – the Silver Temple. See you then!